Siliguri (West Bengal): A 24-year-old ITI boy, Anurag Lakandry, resident of Tindharia, has made miniature models of the famous Darjeeling Toy Train to popularise its glory to the world. Anurag’s brother Abhishek is also helping him to give proper shape to the models. They are making two or three Toy-Train models in a month with the help of metal sheet, unusable items. It is noted that Anurag is getting orders from London, Singapore, Russia and some other places as well. The Darjeeling Himalayan Railway (DHR) or Toy Train is a two feet narrow gauge railway based on zig-zag and loop line technology that runs between New Jalpaiguri and Darjeeling in the state of West-Bengal. The toy train is also a lifeline and pride of Darjeeling, which connects people from hills to plains. Tourists from across the World use to come to for 87 kilometer long adventurous ride. On December 2, 1999 the UNESCO conferred the World Heritage site status to DHR which became only the second railway in the world to receive such status. But continuous landslides disrupted its services. In 2011 a massive earthquake in the region affected its track, offices and other belongings and recently Gorkhaland agitation which is again hits its journey. 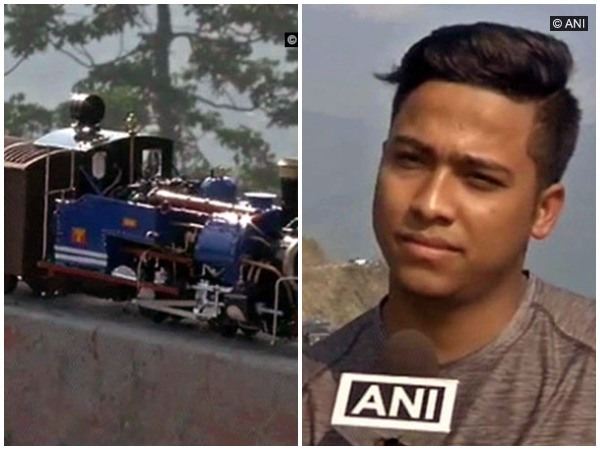 A 24-year-old ITI boy, Anurag Lakandry, resident of Tindharia, has made miniature models of the famous Darjeeling Toy Train to popularise its glory to the world.